I shuddered as my hand felt the bony ridge of his spine. "How did I not notice how thin you are! ", I murmured to him guiltily as I stroked his silky fur. It was early June. 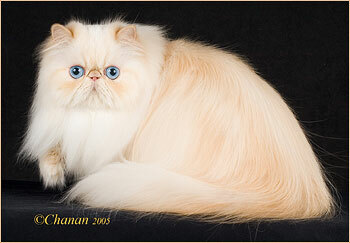 My cream lynx-point Himalayan, GP RW Karabel's Son-of-a-Witch, was almost 9 years old. "Sunny" had never been a very active boy, and over the past year he was having increasing problems with constipation. I feed my cats both canned and dry food purchased from my vet clinic. Sunny was pretty much a dry food guy, and his favorite was a low residue type often recommended for its digestibility. For the past 6-8 months, Sunny had been on twice daily lactulose as well as RestoraLAX (polyethylene glycol) and increasing doses of cisapride, a bowel-motility drug. Although he still had large hard stools, he seemed to be OK — at least so it seemed. A visit to my veterinarian for an examination and x-rays revealed his colon was full of gas and packed with stool. The blood work was ominous, showing elevated calcium and globulin often indicating the presence of tumors. By now Sunny had stopped eating and was hospitalized for IV fluids, enemas, and an ultrasound which showed nothing that could explain his symptoms. Based on a possible diagnosis of inflammatory bowel disease, he was prescribed antibiotics and metronidazole, and before long he began to eat again. "What a relief! ", I thought as I brought him home and prepared to resume our normal life. Relief was short-lived. A week later Sunny had stopped eating again. I offered him a buffet fit for a king of different brands and flavors of dry and canned food, raw and cooked meat, fish and poultry and other treats as my once 8-1/2 lb cat dropped to 7 lbs. Lymphoma was another potential diagnosis based on his complete anorexia and abnormal blood work, so he was put on prednisone and then briefly Leukeran (chlorambucil) as well as various appetite stimulants, all to no avail. By now I had been syringe feeding him a high calorie "critical care" food to keep him going as he continued to be severely constipated and required numerous enemas. Another possible diagnosis, megacolon, and surgery to remove his large bowel was discussed with his veterinarian. 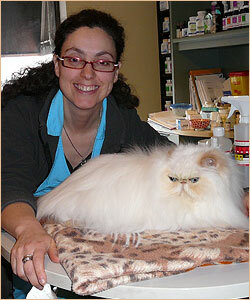 "But megacolon cats usually keep right on eating in spite of the constipation," my vet explained. Then a repeat x-ray of his colon showed the possibility of a partial intestinal blockage. I had initially resisted putting Sunny through exploratory surgery for diagnostic purposes since a diagnosis such as lymphoma had no reasonable expectation of treatment and recovery. But I finally agreed to the surgery — to remove a blockage if necessary, and/or to remove his large bowel at the same time if it was deemed appropriate — and to take samples for biopsy. The surgery revealed there was no intestinal blockage, and examination of his large bowel for motility revealed the good news that his bowel did indeed still have some ability to contract. Samples of his bowel and major organs were sent to the lab for analysis. When the biopsy results came back normal I was relieved. But the question still remained, what on earth is wrong with Sunny? He still wasn't eating. He still had severe constipation — and he had now developed non-regenerative anemia too. It was late August and Sunny's weight approached 6 lbs. I decided to act on my veterinarian's recommendation that I take him to an internal medicine specialist. Over the next month, Sunny remained completely anorexic and his anemia worsened as he was tested for various parasites, lupus, Addison's disease, mycoplasma, and Bartonella henselae. I was aggressively syringe feeding him 5 or 6 times a day just to get enough food into him to stop his weight loss. My entire life revolved around Sunny, his feedings and care. When all the tests ordered by the internal medicine specialist came back negative I really didn't know which way to turn. The next steps suggested by the specialist would include a CT scan and bone marrow biopsy. I was going to go broke trying to save him! But since I could keep him alive with syringe feeding, I just couldn't give up on him either. Sunny had some good days when he appeared almost normal, but he had other days when he sat hunched and uncomfortable, barely moving around the house. A heart to heart talk with my veterinarian was telling. "His may be one of those frustrating cases where we just can't get a diagnosis," was the verdict after yet another detailed review of Sunny's case. The vet then suggested, "Sometimes, Traditional Chinese Medicine (TCM) can find solutions when western medicine can't." I had already taken Sunny to his first appointment with Dr. Rona Sherebrin, a veterinarian at my clinic who practices Traditional Chinese Medicine and acupuncture. Sunny had a couple of acupuncture treatments and was prescribed some herbal preparations including Fan Xie Ye or Senna, a bowel-motility herb and laxative. He was beginning to pass stool a bit more frequently and easily, but he had explosive gas in the litter box and still he didn't eat. 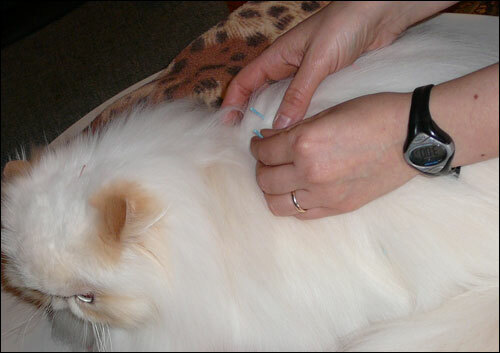 His acupuncturist places several blue-tipped needles into Sunny's back. You can also see a needle in the area just behind /between his ears. 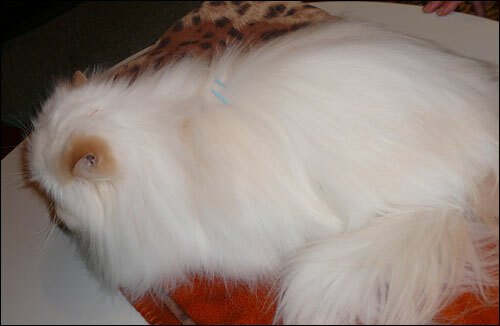 Sunny rests comfortably with the needles in place. Now Dr. Rona Sherebrin did a thorough examination of Sunny, which in TCM includes taking his "pulses" and examining his tongue. He had another acupuncture treatment. "Is there anything you can do about the gas?" I asked. That September Sunny started taking Dr. Sherebrin's prescribed probiotic yeast called saccharomyces boulardii. Two days later, after 4 months of virtually complete anorexia, Sunny started eating again and has been eating ever since! Ten months after this all began, Sunny is a new cat. He weighs 8 lbs and he is eating, pooping, playing and enjoying life again. He is mildly anemic but it doesn't seem to hold him back. I still experience a stab of joy every time I see him march over to his food dish in the morning and push the other cats out of the way to secure his share. It is important that herbal remedies be prescribed and purchased under the supervision of a qualified veterinarian practitioner to ensure their correct application and the purity and potency of the herbs. Sunny doesn't much like his acupuncture treatments and he is casually ungrateful for all the care and worry and money I have lavished on him. In typical cat fashion, he loves my husband more than me and bursts into loud purring with the slightest attention from "the love of his life". I wouldn't have him any other way! Marg Peppler was the first woman to graduate in Mechanical Engineering Technology from Mohawk College in Hamilton Ontario. Along with a challenging career in management and project management, Marg was also a former breeder and exhibitor of Peppurrz Himalayans and Exotics. Marg proof-reads every article we publish, scoping out all the errors that have slipped through the cracks. Her nickname is "Eagle Eyes". 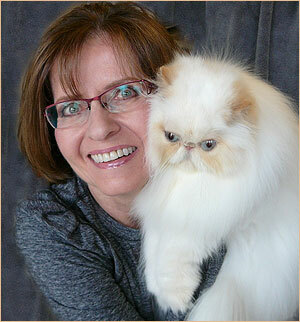 She keeps involved with the cat fancy by working with her good friend, Christine Arnold of Karabel Himalayans and Exotics. Marg also keeps busy with her beloved Persians, 15 year old Robin, red tabby CPC Scarlett, her son Buster and the charming BooBoo. Dr. Rona Sherebrin received her Doctor of Veterinary Medicine degree with honours from the Ontario Veterinary College in 1991. Dr. Sherebrin became a Certified Veterinary Acupuncturist in 2005, and has completed advanced training in Veterinary Tui-Na bodywork and Veterinary Herbal Medicine. She often lectures to both veterinarians and lay groups, and frequently mentors veterinarians interning in veterinary acupuncture.